The time when the first night frosts appear and the forests change into their spectacular colours is also the time when moose at Haliburton Forest commence their rut. The large bulls will try to gather a number of cows and defend these against any contenders. Hormones are flowing and fighting with whatever comes the bull’s way is the order of the day during this 3 – 4 week period. Unfortunately moose are neither bright nor do they have a good vision. As a result they will take on almost anything that moves, making them the most unpredictable animal in these woods during rutting season. That is why the bulls in these clips are approaching humans, where during the other 11 months of the year they’d try to avoid us. Forestry staff at Haliburton Forest are specifically advised about the danger posed by a love-driven bull moose and the only escape, once taken on, is to flee up a suitable, big tree. Overall moose attack more people in North America than bears and wolves combined ! After the rut, moose have a gestation period of 8 months, prompting the calves to be born in the last days of April or the first week of May. Unfortunately moose populations have seen a dramatic decline across North America over the past years, especially along its southern range from NewYork state to Minnesota and Wisconsin. This decline is linked to a number of factors, primarily the spread of brain-worm, winter tick and as a combination the increase in winter and spring temperatures over the past years. 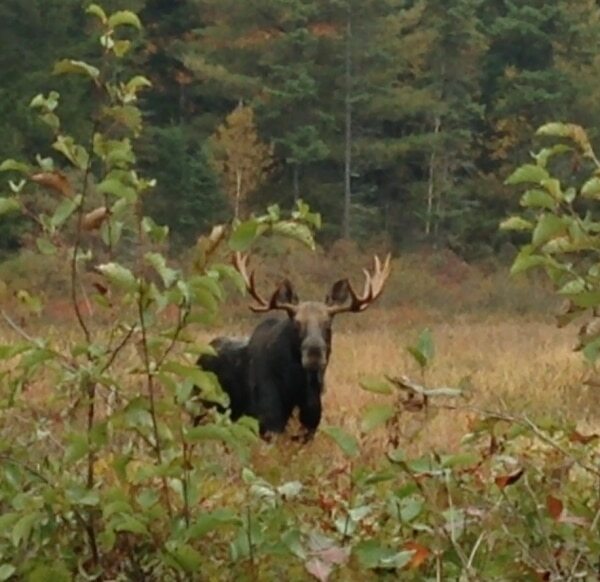 Even more reason to enjoy the movie clip below, taken by Haliburton Forest’s forester Pavel Gmuzdek earlier this week. PreviousFall Colours in the ForestNextOur Wolf Pup Has A Name! !